1. Grind all the ingredients for the gravy together into a fine paste, adding about 2 cups of water. 2. Sauté the gravy with 2 tbsp. butter ( I didnt have butter, just used oil) letting it thicken. Bring this to a boil, seasoning with salt. 3. Mince the cabbage (best done with a food processor). Add salt and leave it for a few minutes. 4. Squeeze as much of the water out of the cabbage as possible. 5. Add the besan to the cabbage, along with the rest of the kofta ingredients, and knead it together. 6. Form this mixture into small balls, and fry them in hot oil until brown. 7. Add the balls to the gravy, and let it soak for about half an hour. Wow that looks so so delicous and the koftas look so perfectly shaped. Delicious koft curry...looks too delicious ..
Cabbage kofta is new to me too and sounds delicious! delishious kofta curry dear, I too had made it last week, tempting snap. I haven't tried koftas with cabbage neither, interesting and delicious!!! nice recipe for special dinner for guess, and thers n potato, Iam up for it. HI Ashwini, this is ruchikacooks. 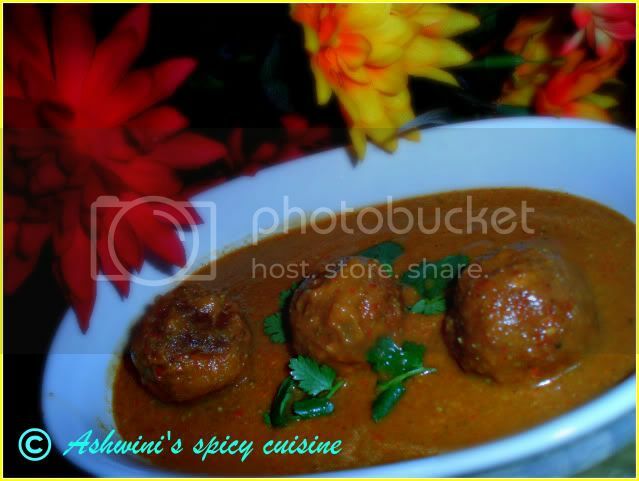 I tried this version of kofta from married to a desi (saw it here ) and it came out well..thanks for sharing. Hi Ashwini! That is so cool that you tried out Shankar's recipe! Glad it turned out so well!